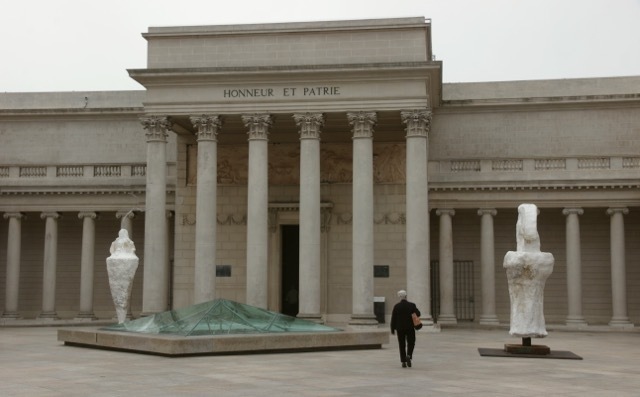 San Francisco's Legion of Honor is again juxtaposing contemporary art with its Old Masters collection and its neoclassical architecture. The temple of art on a hill overlooking scenic San Francisco Bay exudes tradition, and, in our era of sociological art analysis, Eurocentric white privilege: racism, colonialism, imperialism, sexism and so on. Who better to shake things up with the living white males than — of all people — the swaggering neo-expressionist Julian Schnabel? His operatic paintings of the 1980s, with their cracked crockery, antlers, velvet, boxing-ring tarps, and, above all, their gargantuan sizes, exuded machismo worthy of Hemingway or Picasso. Indeed, the art critic Robert Hughes mocked Schnabel's youthful bravado and careerism: "Schnabel's work is to painting what Stallone's is to acting: a lurching display of oily pectorals." Schnabel's "Symbols of Actual Life" comprises fourteen large paintings from four different bodies of work, and three huge sculptures. Nicely installed in the Legion's colonnaded courtyard (the site of innumerable wedding photo shoots and selfies taken with Rodin's "The Thinker") are six 24 by 24 foot untitled paintings, cable-tied to the Ionic columns, three on either side, and exactly as tall as the balustrade above. The paintings, mounted on NASA-worthy aluminum stretchers, are made on strips of lightweight tarp that the artist stitched together. The horizontal bands or registers in harmonized purple and gray recall abstractions by artists such as Paul Klee and Sean Scully, while the superimposed splotches of white gesso that arc and curve across their expanses suggest the go-for-broke flung paint that Francis Bacon occasionally favored or the ectoplasmic exudations of spiritualists a century ago. Those worthy antecedents aside, I don't find the images — which the artist explains, "epitomize much of what are the essential characteristics of the smallest and most nascent proposals of how imagery, drawing and material could be called a painting" — particularly moving or memorable. The size and the Court-of-Honor context lend them what impact they have, as does the conceit that over the next four months they are to be weathered, oxidized and aged, without the preservationist fretfulness normally accorded to luxury objets d'art. Take that, treasure-house fetishists! Accompanying the six paintings are three large sculptures from early in the artist's career in plaster over burlap, set atop sturdy steel frames, also presumably meant to decay in San Francisco's fog. Schnabel's crudely fashioned sculptures, spindle- or urn-shaped and humanoid, sprouting tree branches from their heads, are endowed with titles invoking the classical past and its metamorphoses in later Romantic art. "Helen of Troy" needs no introduction. "Gradiva" is based on a walking-woman bas-relief from Greek art (a copy of which was owned by Freud) that inspired both a 1902 romantic-fantasy novel and a 1970 movie starring the lovestruck lead actor from Alain Resnais' "Last Year at Marienbad." "Balzac" might be Schnabel's tribute to both the larger-than-life novelist and the outsized sculptor who portrayed him as a craggy mountain, or force of nature, Rodin. The paintings installed inside the three Rodin galleries are less impactful, which is actually a welcome relief, given the previous Fischer and Lucas stage-wink shows. An irregularly shaped 1990 series based on triangular Egyptian sailcloths pays abstract homage to the actress-singer Jane Birkin. She becomes an object of veneration for Schnabel much as Camille Claudel was for Rodin, whose portrait of her, atypically delicate, resides in the central gallery. 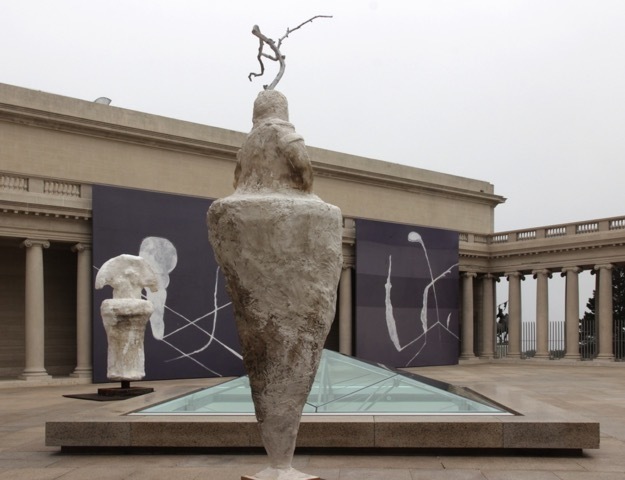 A series of works done on tarpaulins scavenged from Mexican open-air markets pays homage to the ideas of emotion and transcendence exemplified by Rodin, though in minimalist, abstract form, with the ghostly white shapes registering as spiritual forces or presences. Less successful within this context are Schnabel's "Goat" paintings. Begun in 2012 to commemorate the life and death of artist Mike Kelley, it digitally combines the photograph of a taxidermied goat owned by the artist upon which someone had placed a child's stuffed rabbit ("I accepted that as an image. "), and a landscape excerpted from an 1850 wallpaper depiction of George Washington accepting the sword of the surrendering British general Charles Cornwallis. One cannot help but wonder what Joan of Arc, El Cid, Laocoon and his sons, or The Thinker, all represented by statuary nearby, would think — but art is an awfully big adventure, n'est-ce pas?